Provide comfort for the family of Anne Hubert with a meaningful gesture of sympathy. 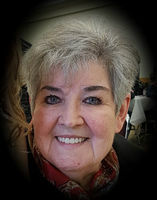 Peacefully, Saturday, March 23rd, 2019, with loving family at her side, at Maison McCulloch Hospice, Sudbury, after a long illness. Beloved mother of Clint MacNeil. Cherished grandmother of Kayleigh, Lochlan, and Breeghan. Dear daughter of John and Cecilia Delorey both predeceased. Dear sister of Neil Delorey (Susan), Ian Delorey (Betty), Kate Delorey (Dave Bailey predeceased), Mary Murray (Dave), Jean Jobst (Alvin), Henry Delorey (Lori) and predeceased by Calum Delorey, Ronald Delorey, and Jim Delorey. Sadly missed by many nieces and nephews. Anne was born in Antigonish, Nova Scotia and relocated to Sudbury as a toddler. She graduated as a stenographer, which she pursued early in her career. Later in life, she worked at Revenue Canada until her illness. Anne lived her Roman Catholic faith devotedly. Her interests included baking, cooking and fabulous tea parties with her grandchildren, listening to her favourite music and spending time with family. She was known for her quick wit, her infectious smile, and her kind, generous and compassionate spirit. Many thanks to her doctors and all the staff and volunteers at Maison McCulloch Hospice and the Shared Care team for their respectful and sensitive care. Tuesday, March 26th, 2019 at 10am. Donations to Companions of the Cross (Ottawa) would be appreciated. To send flowers in memory of Anne Hubert (Delorey), please visit our Heartfelt Sympathies Store. Donations are being accepted for: THE COMPANIONS OF THE CROSS. Consider providing a gift of comfort for the family of Anne Hubert by sending flowers. Anne will be missed by many. I had the pleasure is getting to know Anne while I worked at CRA. Her smile could light up a room, her quick wit and sense of humour had a way of making everyone around her smile and laugh. My condolences to her family. Saddened to hear of Anne’s passing. Our thoughts are with her and her family. Hector and Eileen Shaw , Kentville N.S.